The Xtreme Dancers has again brought pride not only to South Cotabato and the City of Koronadal but also to the Philippines. Jay-R Melody and Macz Alminaza, members of the said group bagged top honors in the recently concluded World Championships of Performing Arts (WCOPA) held in Hollywood, California from July 11-18, 2014. The dance dou from South Cotabato emerged as CHAMPION in the Senior Dance category and was declared as the SENIOR PERFORMER GRAND CHAMPION OF THE WORLD in this year's WCOPA. In the finals, the Xtreme Dancers competed against the dance groups from Jamaica, Czech Republic and China. Watch their performance below. 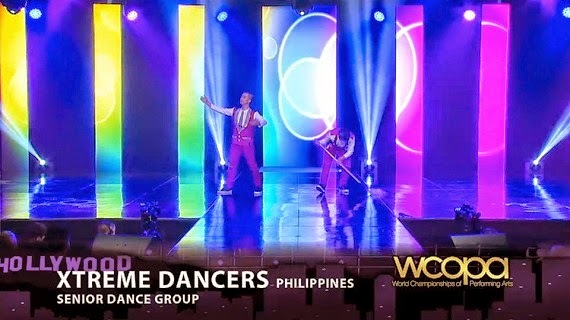 The Xtreme Dancers was the first dance group from the Philippines which qualified to compete in the World Championships of the Performing Arts which is considered as the only official "talent Olympics" for hopeful performing artists.They were chosen to represent the country after winning the championship of the 6th Gatsby Dance Competition Asian Finals held in Tokyo, Japan last March. This year thousands of amateur and proficient artists from over 50 countries have joined WCOPA and competed for the coveted bronze, silver and gold medals in events such as singing, dancing, modelling, acting and instrumentals. Congratulations and thank you for making as proud once again Xtreme Dancers!